Won’t trust anyone else with my hair. Lucas and Nicky are brilliant. Lucas does wonders with my kinks and coils (3c/4a hair). He truly listens to your wants and needs and works with you to develop the shape and style you desire. The atmosphere of the salon is relaxing, and Nikki, the other stylist, is very talented and always helpful. 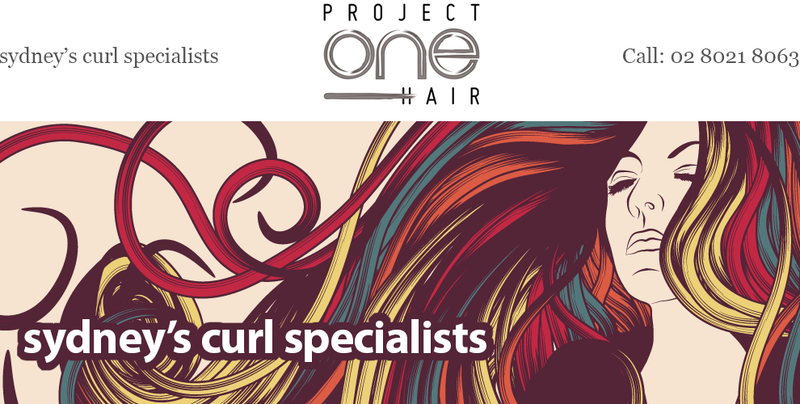 I would highly recommend you try Project One if you’ve got any type of hair, particularly curly. I wouldn’t trust my curls in anyone else’s hands. Absolutely love this salon. It’s one of Sydney’s hidden gems. Thanks Nikki for looking after me and my curls, Im in love !!! Thanks for another great job! Within one hour of Tuesday’s haircut with you, I had already received a “great haircut!” compliment. “It’s Lucas’s creation,” I tell them. I’ve been coming to you now for a year and a half and I’m so glad I found you, because I always know that every hair cut with you will be a good one – right for my head and face shape, and just right for my strong, thick curl. The style holds well in between cuts, too, so I’m a very happy curly head. One thing I remember well when I was researching for a new hairdresser was reading a forum comment which said, “Lucas really understands curly hair” and that hits the nail on the head for me because it’s so true. You and Nicole have created a relaxed and informal atmosphere in your salon, and you are both always the utmost professionals in your dealings with your clients. Thanks for all your good work and see you at my next appointment. I was looking for a hairdresser with experience in styling curly hair and found Lucas at Project One Hair when I checked reviews on the internet. I have coarse curly hair and was unable to have it ‘under control. I booked an appointment for a haircut and was extremely happy with the whole experience. Lucas dried, cut my hair and explained how to style it. He really understands curly hair. The haircut was wonderful! I was able to have my hair down and looking great. I received so many compliments. And to make things even better, the customer service is excellent. Lucas and Nicole will ensure that you always feel comfortable. I’ve been a client for about 2 years and I’m sure I will be a client for many more.